The Two of Pentacles is mainly a card about finances and generally relates to decisions to be made in that area. There will be tension and stress in relation to decisions around finances as it is bound to involve a large sum of money. You may be deciding on whether you can afford to buy that house, car or whether you should save some more. You may be examining the costs of getting married. If you do decide to spend, will it leave you too financially vulnerable? You will have to weigh up the pros and cons and see if you will have enough to go around. Whatever you are purchasing may have extra costs attached so get your figures straight. This card deals with the ups and downs of keeping in control of your finances and your life. When this card appears in a finance spread it can indicate that you are going through a temporary period where there seems to be more money going out then coming in. You may be struggling with bills and trying to work out who to pay first. You are bound to be stressed and fear that there will not be enough to go around. You may need to make some cut-backs and tighten your belt where finances are concerned to get through this rough patch. It may be necessary to take on some extra work or more overtime to clear the backlog of bills and debts. However, when this card is in the upright it indicates that you can manage it even if seems overwhelming at the moment and it won’t be forever. You just have to keep on top of things and let nothing slide. You may have a tendency to worry excessively about money and things may not be as bad as you think so try to calm down. The Two of Pentacles also relates to your physical life and it can suggest that you are finding it all a bit of a struggle at present. You may be juggling several things at the moment and feel your life is bogged down with demands and commitments such as work, relationships, family, study. You may feel that you have too many balls in the air which you fear will come crashing down at any moment. You are bound to feel exhausted and over-worked. Your moods may be affected by it all. The Two of Pentacles can also suggest the sideways movement of money, as in transferring money from one account to another. There is also the possibility of doubling your money as the Pentacles in the infinity symbol reminds us of the embryo splitting in two to produce twins. This card is often referred to as the profit and loss card and can point to investments and playing the stock market. In a relationship spread the Two of Pentacles would suggest that a decision regarding finances has to be made. You may be deciding between two prospective partners based on their financial status. Are you saving to get married or to buy a house? Is it costing more than you thought? Can it be afforded? Is it putting a terrible financial strain on you as a couple? You may be juggling finances to pay household bills or be putting a little aside for holidays etc. The Two of Pentacles can also highlight a relationship that literally keeps you on your toes or a partner who is financially draining you. You may be trying to fit a relationship into an already hectic lifestyle and are finding it hard to find the time for it. Sometimes the Two of Pentacles can suggest juggling two relationships but this is more strongly linked to its reversed aspect. You would need to look to surrounding cards to determine if there is any need for concern. 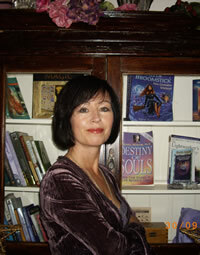 In a career reading the Two of Pentacles traditionally suggested working as a writer or in the publishing business. The type of writing suggested by this Two would be journalism and reporting as we see the young reporter being kept on his toes running from one assignment to another in order to get the latest hot story. With the infinity symbol, the circulation of writing is suggested so you might be advertising, promoting your business or circulating your manuscript to publishing houses. 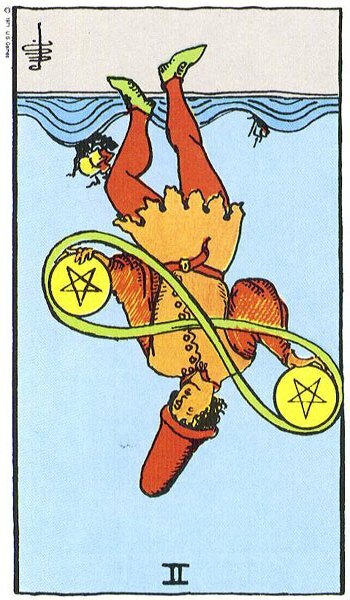 The Two of Pentacles may represent a fledgling business that is struggling to get off the ground or stay afloat. Great effort is being put into making it a success but cash flow problems may be causing tension and undue stress. You may feel that if you can just get past this stage the money will begin to flow much easier. You may well ask yourself why everything must be such hard work? This card indicates that any financial problems you have at present will settle once you stay adaptable and flexible. Do not make any unnecessary purchases at present. Just keep your head down and the business ticking over for the moment. However, you may be trying to reach a decision on whether to start your own business or invest in someone else’s. 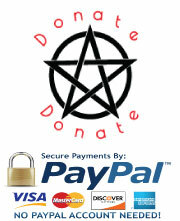 The Two of Pentacles will find you examining your finances to see whether you can afford to or not. We also see the movement from one career to another. You may be putting money aside to go back to college and re-train. On the other hand you may be juggling two careers. In work you may feel overloaded with paperwork and deadlines at the moment. Emails fly in and out and the phone never stops ringing. You may feel you have to work harder than everyone else in order to succeed, pay the bills or get recognition. You may have to choose between two jobs or careers. The decision made will more than likely be based on the financial outcome. You must ask yourself if money is more important to you than job or personal satisfaction? The Two of Pentacles can suggest that you are working as a stockbroker and are keeping a close eye on how the markets are playing. The Two of Pentacles Reversed often points to making a poor financial decision. There is a chance that you have found yourself in a financial mess of some sort and you cannot meet your commitments. You may have had too many balls in the air and they are all beginning to drop one after another. Have you been spreading yourself too thin either financially or personally? Demands on your resources and life have become excessive. This card highlights a time when you need to pay particular attention to finances and keep your eye on the ball. The Two of Pentacles often highlights the mistake of overspending. Credit card bills and loan repayments are threatening to break your back and the bank. How did you allow this to happen? You may be finding it difficult to cope with everything during this time. There is more money going out than coming in and the situation is not going to change for some time to come. You may have been in the money not too long ago but perhaps things have changed. You might have lost your job or have had to take a salary cut. You may have had unforeseen expenses such as having to replace a car or major repair work done on a house. Remember, a low tide always follows a high one and what goes around, comes around. This card in reverse suggests that you may not have put any money aside for rainy day. There may be considerable financial loss. You will have to go back to the Ace and start from scratch. You will have learned a hard lesson from this. When the Two of Pentacles reverses it may be a sign that you are trying to juggle two relationships. Look to surrounding cards for further evidence of this. You may be guilty of choosing a partner based on their financial status and not compatibility or love. Money issues or the lack of it may be causing tension between a couple. Arguments and petty comments replace conversation and fun. It all seems like hard work with no relief. As a couple you may have overstretched yourself paying for your dream wedding and are now living with the horrendous cost of it all. If you borrowed heavily to buy a house, you might find yourself stuck in negative equity as a result of recession. You may have fallen into arrears with your mortgage and now have to accept that you will never own it or be able to sell it. You may be dating someone who is draining you financially or physically. The Two of Pentacles Reversed can sometimes highlight a relationship where the finances of one is kept secret from the other. If a relationship or marriage is coming to an end, your partner may be underhandedly transferring money from your joint account into a private one. This is likely to have been going on for some time. Once again look at the other cards in the spread to check for possible signs of deception. You will pick up on these cards as we go along. In business the Two of Pentacles reversed indicates poor financial decisions. You may have tried to expand your business too fast in the hope of making a quick profit. You might have thrown all your money and resources into the one area leaving you financially exposed and vulnerable. You may be swamped with documents, bills, letters and emails. The ships in the background may not be able to stay afloat. They may be heavily burdened and liable to sink under the strain of it all. It might all come crashing down around you. Cashflow could be causing you major problems. You could be finding it hard to get paid for work done. On the other hand, the Two of Pentacles Reversed can point to underhand business deals and doctoring the accounts. In work there may be problems with a computer crash and files not backed up. You may feel overloaded with paperwork and deadlines. You may have taken on too much or possibly too much is expected of you. You might be expected to do three people’s work and feel exhausted or perhaps you have turned into a workaholic and can’t get enough of it. 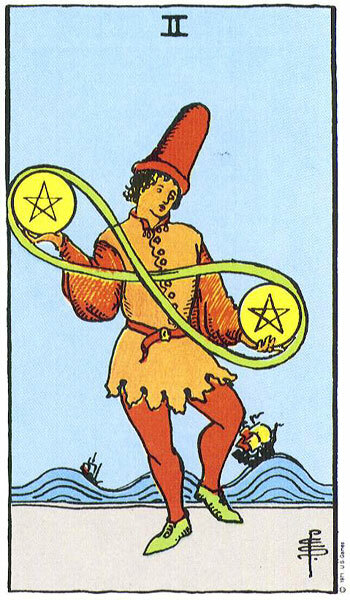 When the Two of Pentacles Reverses caution is required if investing or buying and selling shares. You could be over playing the stock market and taking a gamble with high-risk shares. You could potentially make a huge mistake or error of judgment. You could lose not only your own money but others may suffer as a result too. Don’t be swayed, tempted or convinced by a hot tip. If it looks too good to be true, then it probably is. The low tide suggested by this reversed two lessens the abundant financial energies and major losses may very well occur. You will then have to go back to the Ace and start all over again. The Two of Pentacles Reversed, often comes up for students who have not being keeping up with their studies. We then see in this card a student crashing for exams and suffering from information overload. In the other extreme of The Two of Pentacles Reversed we see someone who won’t spend a penny. Meanness, tightness and greed may be apparent. This card is also a Stage Card, so all this fuss about having no money may all be an act. Someone may be making out that they have less than they do and putting on the poor mouth.